The citizens of early Plymouth Plantation were God-fearing, peaceful people, for the large part. Violence of any kind was uncommon among them. Though they were leery of the Native Americans that they met, they were willing to give them the benefit of the doubt and relations were cordial, even friendly, between them. However, as with any society, there will be aberrations; incidents that go against the grain of the norm, leaving shock and horror in their wake. Such was the case of Alice Martin Bishop. There is some dispute as to Alice's parents. Some research points to her parents being Francis Martin and Prudence Deacon. Many believe her to have been the child of Mayflower passengers Christopher Martin and Marie Prower, and that she sailed with them to America at the age of 4 years. However, as she was not mentioned in Governor Bradford's Of Plymouth Plantation, the Mayflower Society does not recognize her as a passenger. Bradford's account, though, has been found to contain errors, written as it was from his own memory beginning ten years after the voyage. The portion containing the passenger list was written more than thirty years after the voyage, and it is quite possible that Bradford either neglected to include the child on his list by error, or decided not to include her due to her, by then, infamy in the colony. A third possibility is that he mis-remembered whose child she was, since she must have joined another family, probably the Churchills, who raised her, as she was only four when her parents both perished. Whoever Alice's family of origin was, my Mayflower ancestors certainly were her neighbors and knew her well, at the very least. Whether or not she was the child of passenger Christopher Martin, who died along with his wife the first winter in America, she was my 9th great-grandmother. In the month of July 1648, tragedy struck. On 22 July, a friend by the name of Rachel Ramsden visited the Bishop home, when Richard was away from the house. Alice and Rachel chatted and at a certain point, Alice asked Rachel to take a vessel of hers and go and fetch some buttermilk from her house and bring it back for Alice's use. 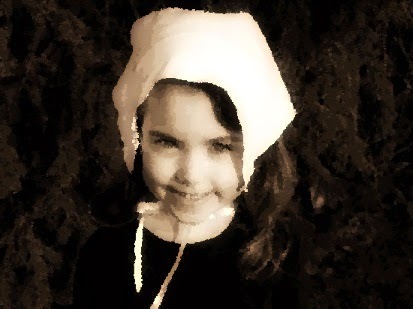 At that time, Rachel later stated that the four year old Martha was asleep in the loft just above their heads. When Rachel returned with the milk, she noticed a large quantity of blood on the floor beneath the ladder that led up to the loft. Horrified, she asked Alice what had happened. Alice mutely pointed up to the loft. Rachel, too frightened to ascend, appears to have assumed the worst. She ran from the home to summon her parents who came, quickly followed by others, all of whom, confirming Rachel's worst fears, witnessed the wounds to the poor dead child, including the slicing of her windpipe and several other slash and stab wounds. Alice appears to have admitted her guilt immediately and been remorseful for her horrible deed. When asked why she had done such a thing, she stated that she had no recollection of perpetrating the crime at all. She was tried and convicted of murder and sentenced to hang. (Several of my ancestors were on the jury; Josiah Winslow, Anthony Snow and William Merrick.) Alice was hanged on 4 October 1648, aged 32 years. She was the first woman to be hanged in Plymouth Colony. It is possible that Alice was suffering from a post-partum psychosis, since she had a toddler and there was no indication prior to this incident that she had been violent in any way. This is presumably the same condition that prompted Andrea Yates to drown her children in a bathtub in 2001. Naturally, no one at that time would have had any notion of such a condition and they must have been truly mystified at the motive for such a horrendous act against Alice's own innocent child. Of Alice's other children; little is known of Abigail and she probably died young. Daughter Damaris and son James both grew to adulthood, married, and had children. Richard Bishop was, incidentally, a thief and general trouble-maker in the colony. He would be fined for theft of a neighbor's spade and, later, the sheep's fleece of another neighbor. He eventually joined his son-in-law William Sutton in New Jersey and died there. We can be thankful that we live in the times that we do now. Had Alice Martin Bishop been alive today, symptoms may have been noticed and she might have been able to get the help she needed to avert the tragic fate of herself and her little girl. "We can be thankful that we live in the times that we do now." Didn't help Andrea Yates any. (sorry, messed up prior post) True, that's why I said "symptoms MAY have been noticed". Though, if I remember correctly, there were several people who knew that Yates was severely impaired prior to that atrocity who might have made sure that she was not left alone with her children. Apparently, effective clinical treatment and adequate safeguards and follow-ups were not accomplished. But at least those are available today and do prevent many such horrible events from happening. There were no such resources in the 17th century.